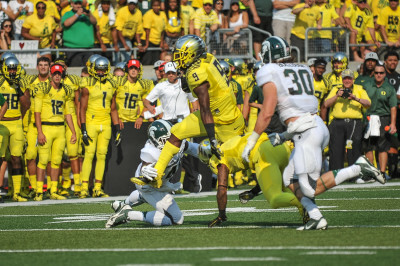 Expectations have become perpetually high in Eugene for the Oregon football team. 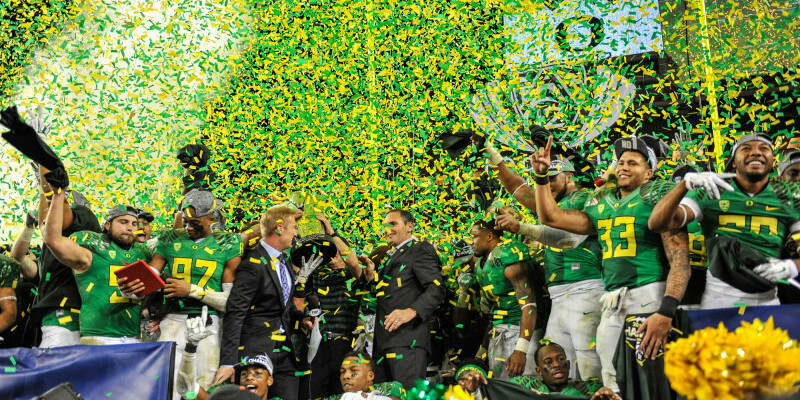 The Ducks have been ranked in the top five of the preseason AP and Coaches’ Polls for each of the last four years. The Ducks have then backed up these expectations by making it to the National Championship Game twice in the last five years and by being in strong contention to reach the national title game late into each of the other three seasons. The 2015 campaign looks to be on track to follow a similar path. Early preseason polls once again have the Ducks pegged in the top five. Experts are predicting the Ducks will be contenders again this year despite losing many key players to the NFL — including the best player in program history — Heisman trophy winner Marcus Mariota. In addition, notable All-Americans Hroniss Grassu and Ifo Ekpre-Olomu, and first-round pick Arik Armstead are gone. 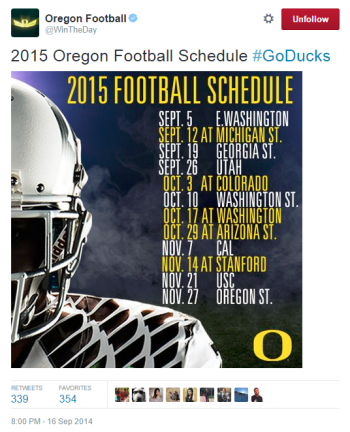 So what are realistic expectations for the Ducks in 2015? Would anything other than winning the program’s first national title be considered a failure? Or is making it to the title game a must for success? Would winning the Pac-12 North and making a New Year’s Six bowl game be sufficient? Or, with Mariota and others gone, is Oregon actually in rebuilding mode for the first time in years and ANY top 25 finish would be a success? When you look at the talent Oregon has on its roster and how experts are putting Oregon in their preseason top five, this does not feel like a rebuilding year. Additionally, Vegas’s win total lines have the Ducks tied for fourth in the nation in expected regular season win-total with 9.5. Given all of this, Oregon should not be in rebuilding mode and should challenge for a playoff berth and the Pac-12 title. Anything less would be a disappointment for this team. However, given the quarterback situation and question marks throughout the defense, expecting a national title feels a bit unrealistic. Even one loss during the regular season or in the Pac-12 championship game can end a team’s national championship aspirations (just ask one-loss TCU and Baylor last year). If you look at the Ducks’ 2015 schedule — even if they do develop into a great football team — I believe there is almost certainly at least one, probably two, losses on the schedule. Of the Ducks’ 12 regular season games, two of the three non-conference games are almost certain wins. The Ducks would be unwise to overlook any team (see Appalachian State over Michigan in 2007), but Eastern Washington and Georgia State have little to no chance of beating the Ducks. EWU is solid — but a solid FCS program — that lost its best player, Vernon Adams, to the Ducks. Georgia State just launched its football team in 2010 and joined the FBS in 2012 and has a combined 2-33 record since then. The other non-conference game is extremely difficult. Michigan State, like the Ducks, will be ranked in the top-10 at the beginning of the season and opens up as a 1-point favorite at home against the Ducks. MSU is led by senior quarterback and likely first-round draft pick Connor Cook. It’s not unlikely that the Ducks could very well suffer their first loss of the season in this second week. Byron Marshall and the Ducks will look to beat a top-10 ranked Michigan State team for the second time in two years. The Pac-12 has proven year after year that even what appear to be blow-outs on paper can be very close games or losses (remember Washington State and Oregon last year). Having said that, Oregon should take care of business against Colorado, Washington State, California, and Oregon State, all rebuilding this year. Additionally, Oregon should also handle Utah and Washington, both of whom are at least two-touchdown underdogs against the Ducks. Obviously, anything can happen in Pac-12 football, but Oregon has been almost undefeated the last five years against teams who were not ranked in the preseason polls. The lone exception to that was Arizona the past two years. Arizona was receiving votes in preseason polls each of the last two years despite not being ranked. The Pac-12 slate also includes tough games against Arizona, who is listed as a five-point underdog against the Ducks — despite returning a lot of talent and beating the Ducks each of the last two years during the regular season. Stanford, generally a tough matchup for the Ducks, is currently listed as even odds against the Ducks. Oregon’s other Pac-12 game this year is against USC, a trendy college football playoff pick and likely preseason top 10 team. Oregon is currently a 6.5 point favorite vs. the Trojans at home. The Ducks are widely predicted to face the Trojans again in the Pac-12 championship game where the Ducks will not have the benefit of a raucous Autzen stadium like the regular season game against the Trojans. Oregon has proven over the last five years that it doesn’t need to rebuild, that contending for national championships and playing in major bowl games is the norm. However, in the hyper-competitive college football environment, expecting a national title is foolhardy, especially given the Ducks’ questions at quarterback and on defense. The Ducks do have the talent and schedule to make it back to the national championship game this season but are much more likely to finish with about ten wins and two losses in the regular season. A 10-2 or 9-3 record should put the Ducks in the Rose or Alamo Bowl, either of which should be viewed as a solid season.